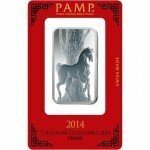 PAMP Suisse is perhaps the most recognized precious metals brand in the world. The refinery in Ticino, Switzerland is responsible for producing some of the finest, purest gold and silver bars in the world. Among those producing Lunar Series products, it is a leader along with the Perth Mint in Australia. 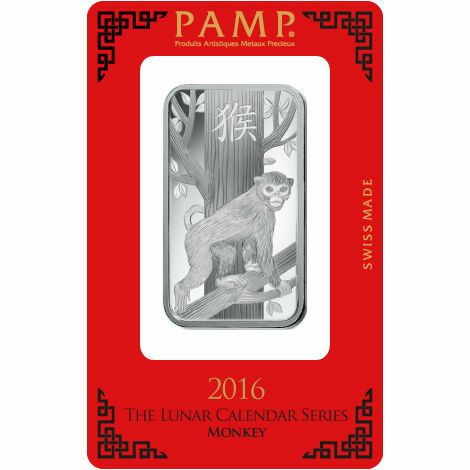 Today, Silver.com offers the popular 1 oz PAMP Suisse Silver Lunar Monkey Bar in brand-new condition. Features the latest Lunar Series design. Honors the Year of the Monkey. Bars ship complete with an assay card to authenticate the product. Produced by PAMP Suisse in Switzerland. China’s Lunar Calendar resets in February of each year, and follows a 12-year cycle. Each of the years in the cycle has a unique animal assigned to it. Those born under the sign of those animals are said to share character traits with those creature. There are many tales as to how the Zodiaca came to be, and the most popular involves a call to meeting from the Jade Emperor. He is said to have offered each animal a spot on the 12-year calendar cycle, awarding the animal a position based upon their finish in the Great Race to meet the Emperor. The monkey is the ninth animal in the cycle. 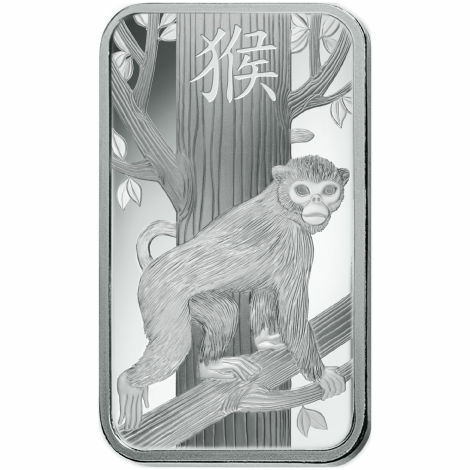 On the obverse side is the front-facing image of a monkey as it climbs a tree branch passing in front of a tree. In the trunk of the tree there is an engraving that represents the word monkey in its Chinese symbol. The reverse face bears the opposite image of that found on the other side. This time, you can see the backside of the tree trunk. All that is visible of the monkey are its head and its tail as it wraps around the base of the trunk. 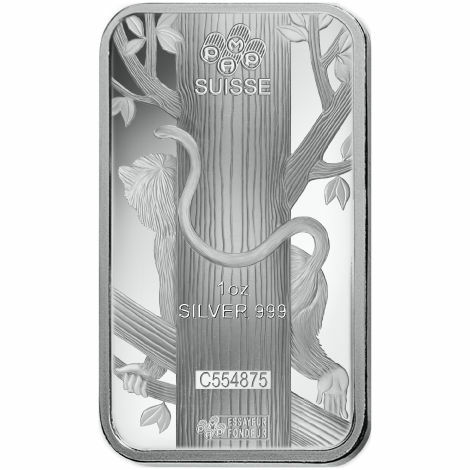 This is a common design theme from PAMP Suisse, creating a visual as though you are looking through the silver bar at the obverse design. 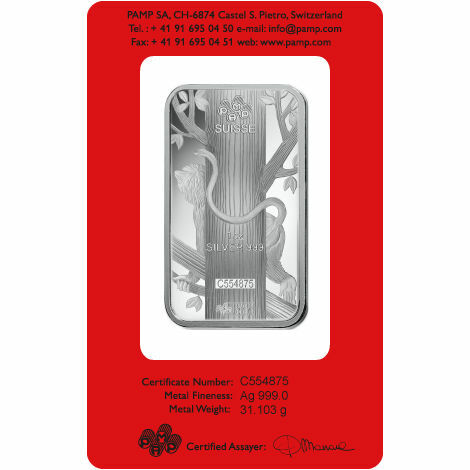 PAMP Suisse was founded in in Ticino, Switzerland in 1977, and today is part of the MKS Group from Geneva. MKS is a global precious metals and financial services firm. Please direct any questions to a Silver.com associate at 888-989-7223. We’re also available online using our live chat and email services. 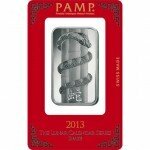 If you are interested in similar products, check out our full collection of 1 oz Silver Bars.